Festival: Dot to Dot, Bristol - Daisy Chains. 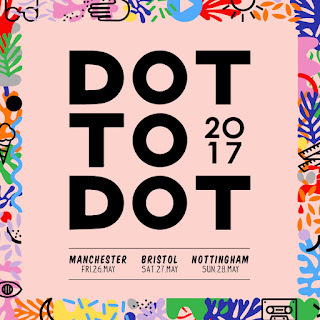 Last Saturday saw the return of Dot to Dot Festival to Bristol city centre. With so much to see due to their massive line up it was quite the struggle to decide who to catch. Running between most venues proved more difficult than one would anticipate with a 10-15 minute walk placed firmly between most of the venues. After checking in at Thekla to collect our passes and guides for the day we strolled along the breathtaking Bristol Harbourside, and wound up in SWX to catch The Big Moon. Amongst their songs, was a strikingly fun cover of Madonna’s well loved classic ‘Beautiful Stranger’ that had everyone in the packed out and sweaty main room of the the venue singing and and dancing along. However what really got the crowd pumped up was their penultimate song ‘Bonfire’ off their latest album Love In the 4th Dimension. In between sets, we strolled over to the main festival village to see what was going on. We found ourselves sticking around in the lower deck of Thekla to watch London act TENDER play a very laid back set. Although we had never heard of them before, we throughly enjoyed every minute of their set. Their music can be best described as a combination of house, indie and even elements of R&B all mixed into one. The track that stood out the most to us was titled ‘Outside’ that was completely infectious and possessed the qualities that made it stick in our heads for hours after their set. Towards the end of TENDER’s set we rush back over to SWX and made our way up to the smaller sized room 2 to watch Brighton based Yonaka. The band are in high spirits, and are completely full of energy when they storm the stage for their first song ‘Wouldn't Wanna Be Ya’ which is followed by their far more angstier numbers ‘Salty’ that had everyone moshing along. Upon, completing their third song ‘Gods and Lovers’ the band seem completely overwhelmed by the support that they have in the room. They comment that none of them imagined that there would be that many people at the festival who would come to see them play. They even remarked that they thought that their maximum crowd size would have probably only have been 4 people. Overall, the band played an excellent set and that was well received by their fans. Right after, we ran over to the O2 Academy to catch the unmissable headliners Sundara Karma. The band kicked off their set with ‘Flame’ which sent everyone into a frenzy. Frontman Oscar Pollock had not a single struggle in belting out every single note to their songs that resonate through the entire venue effortlessly with great strength. Although the band have quite recently come out with their debut album Youth Is Only Fun In Retrospect, the band are already working on new material. The band even treat the crowd to a few new songs in their set. The festival ended with Sundara playing an encore of ‘Happy Family’ and ‘Explore’ that featured confetti showering down on the crowd to end the festival off on a high. Overall, the whole festival was a success, there were a vast array of brilliant bands on the bill, though it would have been better if the venues were a bit closer together as a vast amount of time was spent on getting lost and trying to find your way from one venue to the next. But on the plus side, there were many favorites at the festival, good vibes and brilliant weather for the day. The fact that there were also a good amount of less well known bands to balance out the more prominent names on the bill worked well as we left with new favorites from the festival. This year proved to be as great as any other year for the festival, leaving us with high hopes for 2018 and many more years of Dot to Dot to come.